Why did you remove so many features from Acronis Backup 12 compared to 11.7 ? Hi, some days ago I've migrated to Acronis Backup 12 and I noticed that lacks many of features already present in Acronis 11.7. It's no longer possible to export/import a backup plan (I cannot find an option in web console), I tried via command line but it doesn't works. http://dl2.acronis.com/u/pdf/AcronisBackup_12_cmdlineref_en-US.pdf, so So I assume that you removed the functionality. GFS backup scheme, is no more present as feature, is possible only via trickly custom backup scheme. Backup of disks cannot be more possible, you need to use partition backup to create abackup that contains all partitions. It's no responsive, all options are little sidebar even if you have a high-resolution monitor. I need to login everytime even if I am on localhost. It's no more possible to schedule a backup validation, fo example in Acronis 11 I've scheduled a daily backup and backup validation once a week. 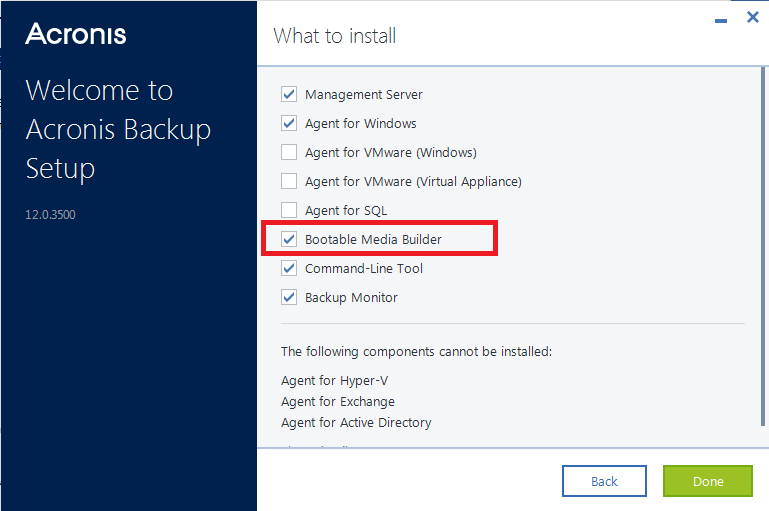 Acronis Rescue Media Builder is no longer part of Acronis backup (I see that you release a new version for true Image 2016 but no for Backup 12, Why?). Windows PE 32 bit plugin can be download, but I can't understand how to use because you don't provide any kind of documentation. I am so disappointed that I thought about going back to 11, but since you have ceased to support it for months (for example has no a support to windows PE 10), I decided to hope for the future and continue to use 12. But why you removed so many features, why you ruined a so good product? Probably there are lots of other issue, I invite other users to report them if they will discover new. I hope that in the future you will improve the product, because if you continue to remove feature, is cheaper to migrate to other free solution. 1. We will add import/export backup plans in one of future updates. 2. Yes, Tower of Hanoi is not supported now. It is very complex scheme and according to our statistics it is used very rarely. Also, it can be emulated via custom scheme. 3. By default, we have "Always-incremental" scheme (for local folder, network folder and cloud destinations), but retention rules are GFS-like (several backup sets depending on the schedule with separate rule per backup set). May be in future we will add GFS scheme back. Ability to create folders we will add in the updates. File filters are already in the product - in the backup options ("gear" button on the backup plan). May be we need to make this option more visible. About "I need to login everytime even if I am on localhost. " - we will integrate Windows authentication, thus you will be automatically logged into the web console if you are administrator of the machine where AMS is installed (by default, administrators can log into web console, but in is configurable). 6. Backup validation on schedule along with other scheduled operations with backups will be added in future updates. 7. Bootable Media Builder is included into the product. It is installed automatically by default. See attched screenshots. Thanks very much, I look forward to the new version. For Acronis Media Builder, was my mistake, I had it already installed, I think I had some indexing problem, I found it into "C:\Program Files\Common Files\Acronis\MediaBuilder\MediaBuilder.exe". It's hard to add a link into web console? 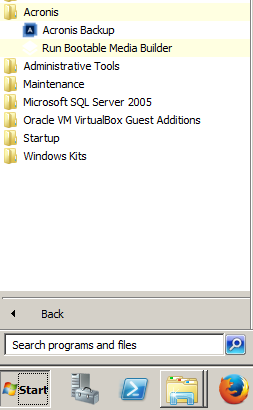 For File filters, probably I'm explained wrong, I intend filters in file explorer, (see the attachment). If you use a native Windows Applicaton, you can use the native file explorer to open/find files or folders, otherwise if you use a web application, you need to replicate all funcionality. Anyway for now it is already a great thing if you add the functionality to create folders. So what you're really saying, let's be clear here, is this is alpha-level code that you've forced on us (for Partners you unceremoniously disabled our NFR keys for 11.7 and forced us to go to 12, despite that FACT that you have no Advanced Workstation version and you're missing so many features it looks like this is not even out of the prototype stages. What I'd really like to know is what is Acronis' "OMG Plan" when one of the browser vendors updates their code and it breaks your product? You have a horrible, dismal, terrible history of fixing bugs in a timely fashion so if you have no plan here, and that plan had better be a 24-hour turn around and an AUTOMATIC update not a 1GB download, then this is a product we cannot sell or recommend to our customers. We already had one today say they would never deploy this. They and we won't be alone.